While the Harry Levy Amusements team is currently enjoying a fantastic DEAL show in Dubai – the company's Commercial Director Matthew Deith reveals the games that are his hot tips for Europe this Easter. "Among our most successful games at the moment are Connect 4 Hoops from Baytek Games and the Virtual Rabbids VR attraction from LAI Games," he said. "I would go so far as to say, no FEC should be without them this season." "It adds another dimension to the already-popular basketball redemption piece and we are finding a lot of repeat play for this particular game," adds Matthew. 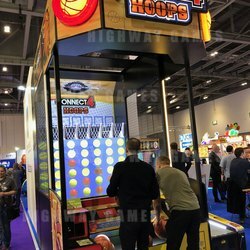 The Connect 4 Hoops cabinet is 12 feet tall and 12.5 feet deep, and the Hasbro license ensures intuitive gameplay, encouraging basketball fans and coin-op enthusiasts to get in on the fun. Virtual Rabbids is the industry's first attendant-free VR attraction for arcades and FECs. Developed from the ground up by LAI Games to operate like any other coin-op amusement game, The Big Ride was created in partnership with leading game developer Ubisoft. The attractive and practical cabinet design reflects LAI Games' time-honoured experience in arcade game design, with a high quality and exciting all-ages VR experience that provides entertainment for both first-time users and experienced enthusiasts. "Players can choose from three unique experiences, full of twists, turns, thrills and spills, for an all-ages VR attraction that lives up to the hype!" says Matthew. "Operators are reporting incredible cashbox returns on this immersive experience."